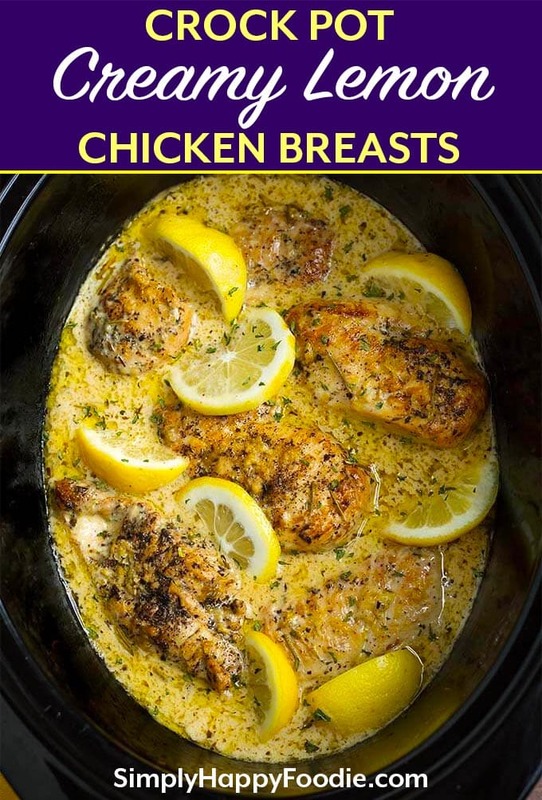 Crock Pot Creamy Lemon Chicken Breasts is a delicious family meal! Serve this amazingly creamy, buttery, lemony chicken with pasta, mashed potatoes, or rice. 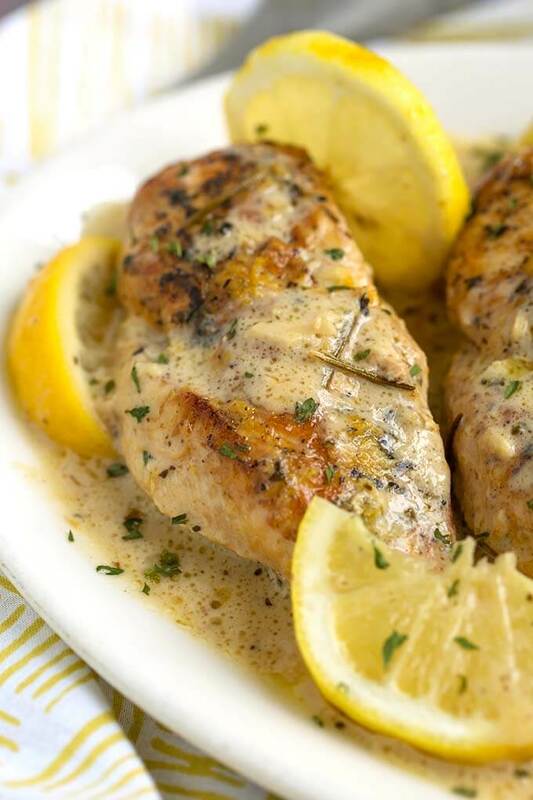 This slow cooker creamy lemon chicken breasts recipe is sure to become a favorite! 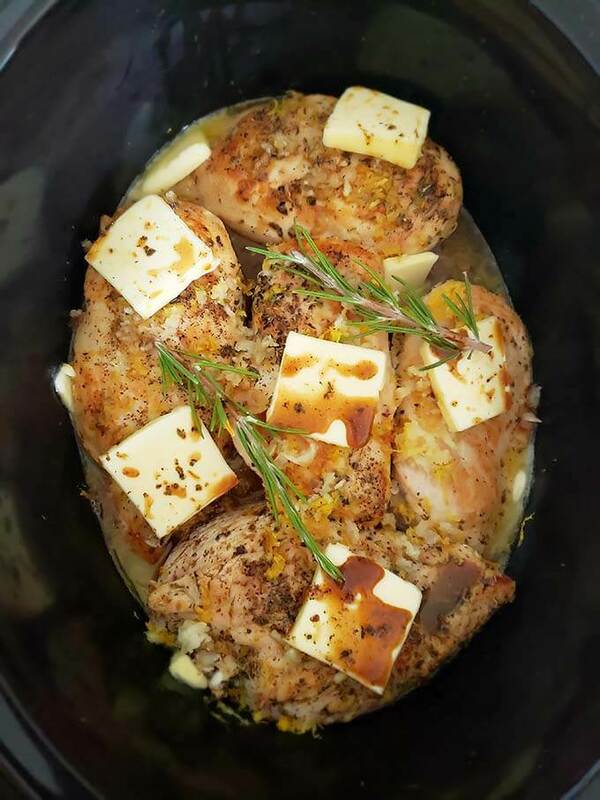 A great slow cooker chicken breast recipe! Of all of my slow cooker recipes, this one is in my Top 5 favorites! If you like lemon, then this is a great recipe for you. Letting the Crock Pot® do the heavy lifting means I can do the prep, brown the chicken breasts, and then let it cook while I get stuff done! Also my house smells so good while this is cooking! I suggest using good sized chicken breasts for this recipe for the best results. Leave them uncut as smaller pieces will be dry in the end. No one wants dry chicken! If your chicken breasts are on the small size, reduce the cook time about 45 minutes to an hour. You can always add time, but you can’t undo overcooked chicken! Another option is to use chicken thighs. If you do, I suggest bone-in, and my personal preference is skin on. So tasty! 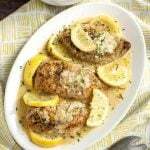 To make Crock Pot Creamy Lemon Chicken Breasts recipe, You just need to brown the chicken breasts first, then deglaze the skillet and save those flavorful juices to add to the crock. Then add the chicken breasts to the crock pot and add all of the other ingredients except for the cream and corn starch. See the recipe card for the full details. Serve this wonderful Slow Cooker Creamy Lemon Chicken Breasts recipe with pasta, rice, or my favorite, mashed potatoes! So good! This recipe will feed five people, and I think you could sneak in an extra chicken breast if you needed to! 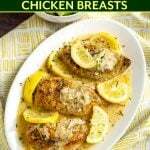 You can also slice or shred the Crock Pot Creamy Lemon Chicken Breasts right before serving, and have your starch waiting on the side so everyone can take as much as they want. This recipe would also be easy to double. 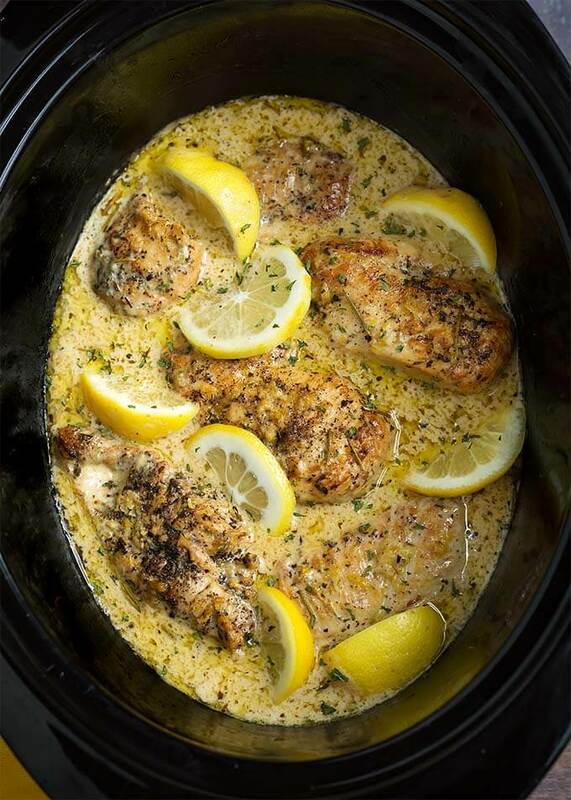 Crock Pot Creamy Lemon Chicken Breasts is a delicious family meal! Serve this amazingly creamy, lemony chicken with pasta, mashed potatoes, or rice. 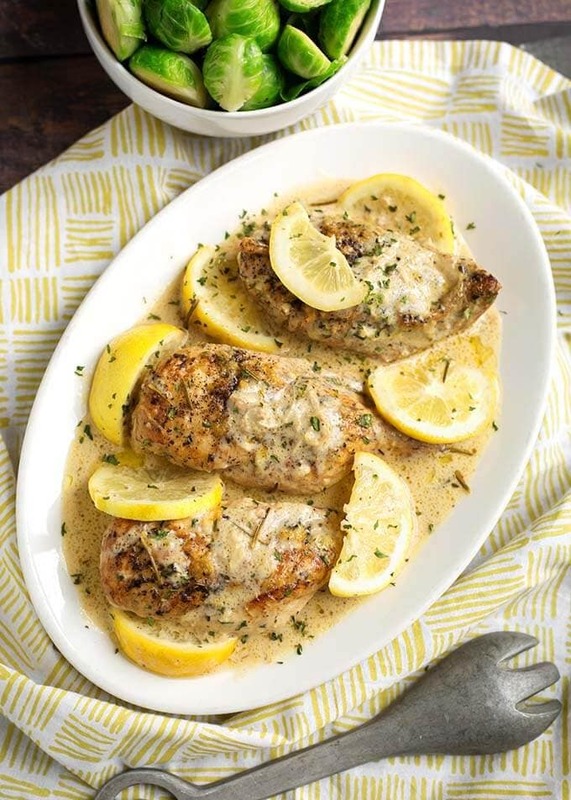 This slow cooker creamy lemon chicken breasts recipe is sure to become a favorite! Season the chicken breasts with the salt and pepper. Set aside. Heat a skillet on med-high heat and add 2 Tbsp of the butter. Then add the chicken breasts and brown them just a few minutes on both sides (you may need to do this in 2 batches). Remove to a plate and set aside (They will still be raw inside). Lower the heat to med-low and add the Italian seasoning to the skillet and stir it around to bloom the spices. Then add the chicken broth and deglaze the pan (stirring and scraping up all of the browned bits from the bottom of the skillet). Stir in the bouillon and dissolve it in the pan juices. Set skillet aside. Add the chicken breasts and the juices on the plate to the slow cooker, in one layer. Then add the garlic, lemon zest, and lemon juice. Cut the butter into pieces and distribute over the chicken. Pour the reserved pan juices in the skillet over the chicken. Put the lid on and cook on Low for 3 hours or High for 2 hours. Whisk together the cream and corn starch, until there are no lumps. Pour over the chicken, replace the lid, and cook on the HIGH setting for 1 hour. Remove the chicken breasts and set on a plate. whisk the sauce to make sure everything is well combined. Taste and adjust salt, if needed. At this point you can serve the chicken breasts whole, with sauce over them, or shred or slice the chicken and add it back to the sauce. This is delicious served over pasta, mashed potatoes, rice, or whatever you like! Garnish with lemon slices, fresh parsley, parmesan cheese, freshly ground pepper. Thank you, Maureen! So glad you and your hubby enjoyed this recipe! Any idea how it would be if I added a layer of brussell sprouts on top for the full cooking time? This looks delicious! I haven’t tried that but it sounds delicious! I would just try it. Maybe halfway through cooking give them a stir or baste them to add more flavor and keep moist. Yes, just warm it back up slowly.